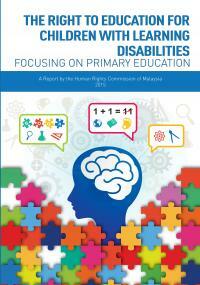 Malaysia, which has ratified both the Convention on the Rights of the Child (CRC) and the Convention on the Rights of Persons with Disabilities (CRPD), is currently progressing towards universal primary enrollment through its “2013-2025 Education Blueprint”. Effective monitoring by civil society organizations and, crucially, the Human Rights Commission will be essential if the plan is to achieve its goal of ensuring equal access to quality education for all children. CESR has been working with SUHAKAM to ensure the government’s plan reaches children with learning disabilities, and this collaboration has now culminated in a new SUHAKAM report. ‘The Right to Education for Children with Learning Disabilities’ was developed with guidance from CESR as part of a joint initiative between the Center and the Asia Pacific Forum aimed at strengthening the role of national human rights institutions (NHRIs) in protecting economic and social rights. This project, which has supported collaborative partnerships with NHRIs in the region since January 2012, has already aided the New Zealand Human Rights Commission’s work to monitor human rights after the Christchurch and Canterbury earthquakes, and that of Palestine’s Independent Commission on Human Rights, in ensuring the Palestinian Authority’s National Development Plan realizes economic and social rights.